There had been a lot of fresh snow, so our drive through the winding roads up to Courchevel Moriond had been spectacular on this dark January winter’s evening. We eventually arrived at the Manali at 1650 metres; at first we were not sure if it was the entrance or the back of the hotel that we had arrived at for the Manali is built looking towards the mountains and the slopes with a secluded entrance facing the road. The concierge took control and sent us upstairs to the heart of the hotel where the reception is whilst he parked the car and handled our entourage of luggage. The main social area is open plan with the reception, restaurant, bar and lounge all connected, with windows facing out towards the mountains and pistes of Courchevel, however it was dark and this view would have to wait until the next day. The Hotel is named after the high altitude resort Manali in the Himalayas and as the name suggests, the interior design echoes the styles, designs and craftsmanship of that part of the world, it is kind of Alpine meets Himalayan, something not often seen in the Alps. 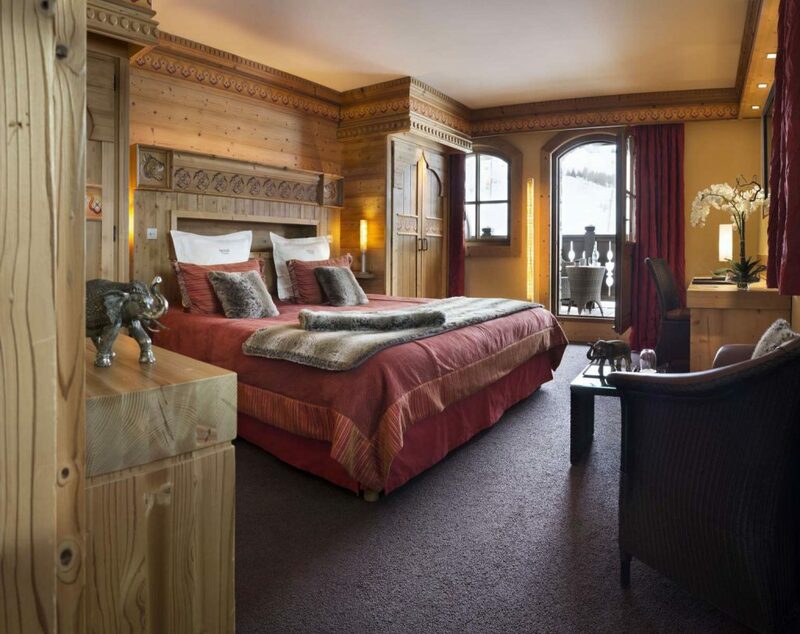 We were shown to our room which had a mix of these two styles as well, which made for a very cosy and comfortable stay with its pine wood walls decorated with indian motifs and oriental arabesques, rustic red alpine textiles and furs. When shown around the hotel we discovered that the various rooms and suites of which there are 37 in total, come in three different styles like our Himalayan style to the Canadian Rockies with its sturdy logs structures, wood cladding, fur throws and more simplistic designs. 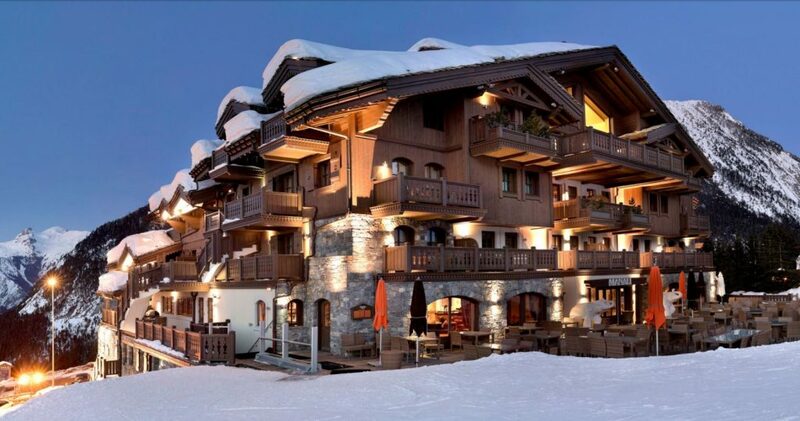 The third style follows Swiss Alpine interiors with leather chairs, panelled walls with trim and a little more finesse that the Canadian style, but all interiors have homely and comfortable qualities to them. Once in our room we made ourselves comfortable and freshened up for dinner. 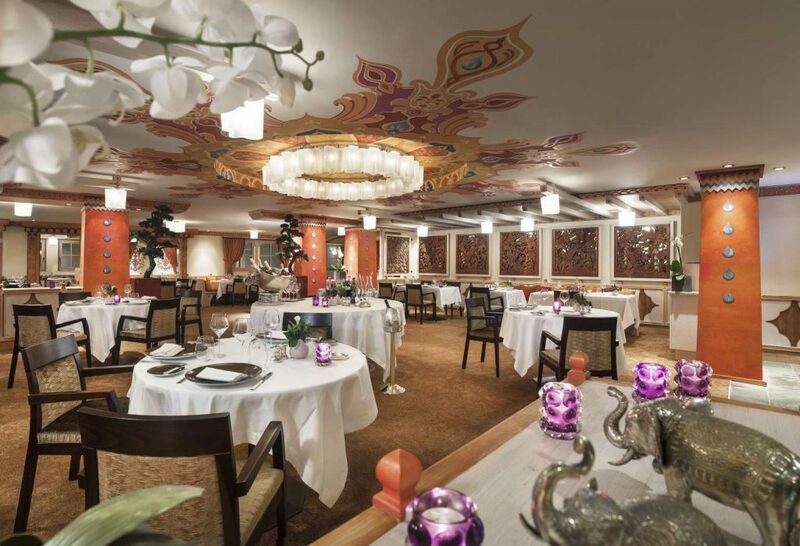 The Restaurant also had hints of the orient with Saffron coloured walls and more Indian style patterns on the ceiling. We sat close to the fire, which pleased Cheeky immensely. We were to experience the food of chef Jérôme Faget, with its hint of Mediterranean and southern Alps all made from local produce or from the gardens of the world. Not only was each and every dish absolutely delicious, but all the dishes were a work of art, it was a pleasure to stop and admire every course before devouring the delights in front of us. Our particular favourite savoury dishes were Langouste tail from Cuba with Virgin sauce and Wasabi Mayonnaise, Foie Gras with quinces, toast and salad, roasted Veal with coloured beetroots, onion crumble and tonka juice, Roasted Simmertal beef, Mona Lisa pancake with herbs and french bean with a jus. We both looked forward to these meals at the end of every day on the mountain. The desserts were just as divine too, from Chocolate Mirage ”Foret Noire” flavour, to meringue in a half-sphere, white chocolate and basil cream with raspberry sorbet. 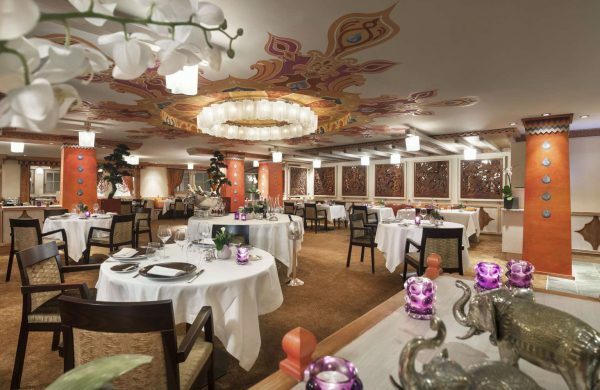 It is suffice to say that we were never disappointed with the cuisine at the Manali and we look forward to the day that we can return to ski in Courchevel and eat their delectable food. 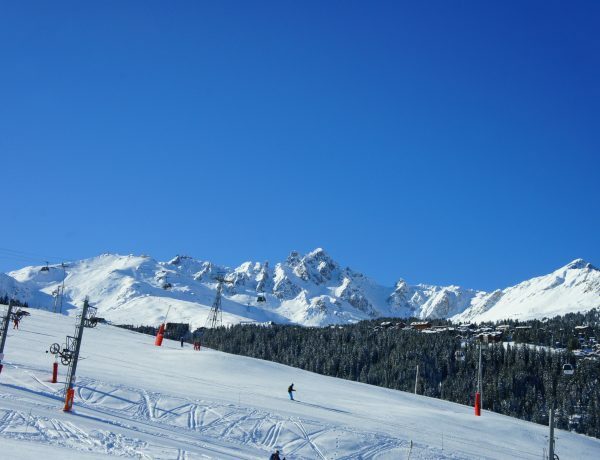 Each morning we were lucky enough to wake up to perfect blue skies and fresh snow. The views from our balcony were to die for, with the pistes in the foreground and a stunning mountain range in the distance, this is one landscape that I plan to paint when I get back home. Once we had eaten our full of the delightful Manali breakfast it was time to head out to the ski slopes. The Manali had the perfect set up, possibly the best of any hotel that we have visited before or since. In the bowels of the hotel is the in house ski shop, with equipment rental as well as shopping, ski storage and maintenance. We would arrive to warm boots every morning, with our skis ready and waiting in a rack just by the slope and when we skied back on the Belvedere or Marquis piste, we just had to leave our skis in the same rack and they would magically move themselves to the ski storage room; perfect Ski-in/Ski-out, very civilised I must say. 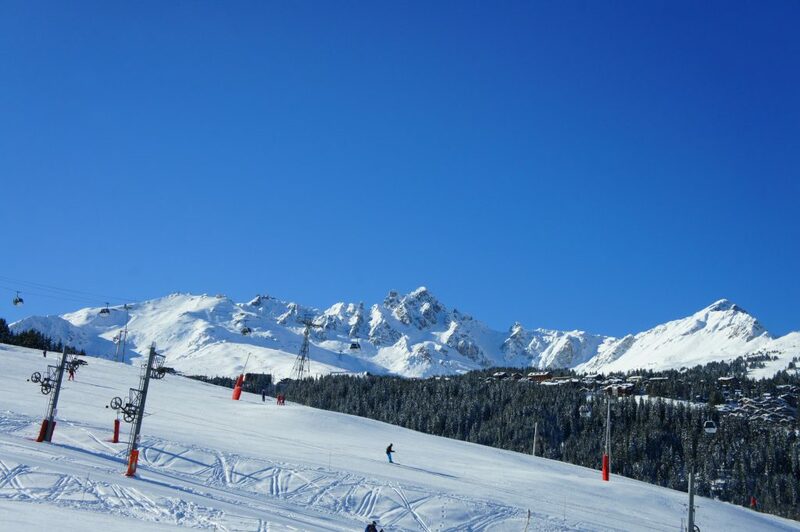 They are also willing to give tips on the best places to ski around Courchevel. The location of the Manali is such that it has great access to many greens and blues so the location is perfect for families with little ones learning to become snowsports superheros. The Manali is well set up for kids as well, with the ‘Children’s Cottage’ where children from three and upwards can play the day away whilst one explores the mountains. 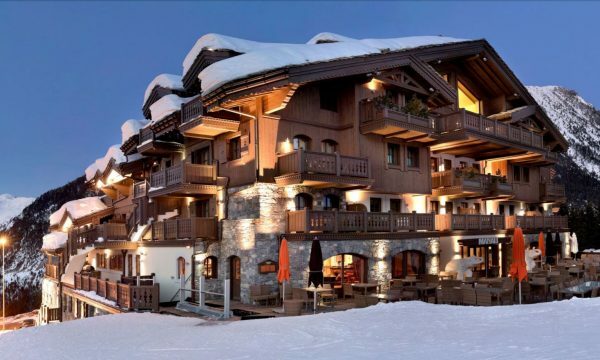 The Manali is also a fabulous place for relaxation, due to its location the south facing terrace and balconies receive the most sun out of anywhere in Courchevel, well into the evening. However, it was January and a little chilly whilst we visited, so the double sided fireplace was a good place to hang out whilst sipping Vin Chauds. 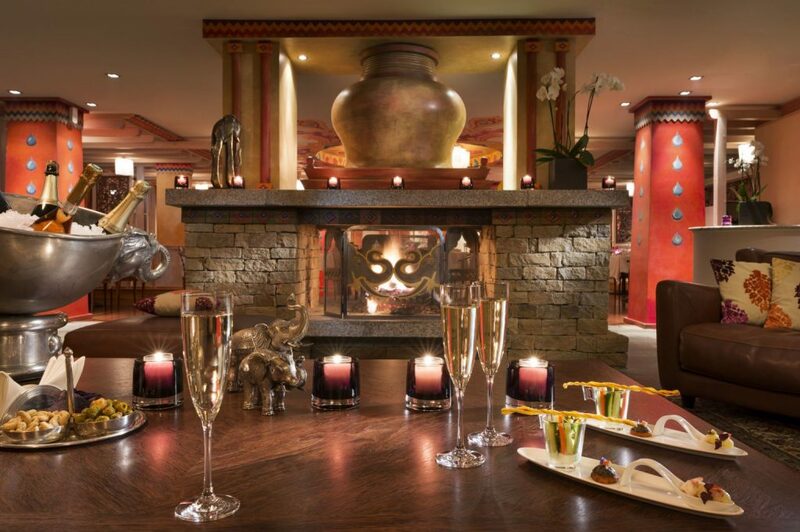 Alternatively, the Manali spa was one of our favourite places to unwind with its sauna, hammam and indoor swimming pool. I have to say whilst writing this review, and reminiscing about our time in Courchevel, I do have very fond memories of our time at Manali Hotel, it really is worth taking some time out of life and heading off to the Manali at Courchevel 1650.